Starting in v4.0, the Corgi Engine comes with the Inventory Engine, More Mountains’ complete and autonomous inventory solution. It also comes packed with 2 demo scenes and ready to use items, so you don’t have to worry about plugging one into the other, it’s already setup for you to use. CharacterInventory : a new Ability, that will allow you to bind up to three inventories to your character. You just need to type their names into the main, weapon and hotbar inventories, and the rest is taken care of. 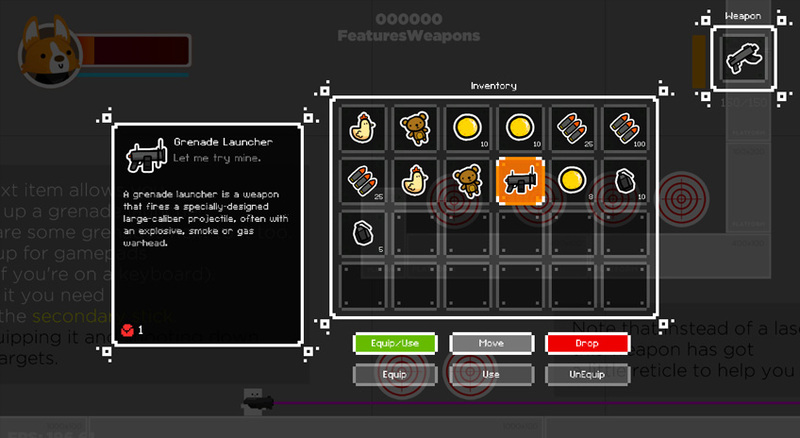 FeaturesInventory and FeaturesWeapons : two demo scenes focused on inventory features, such as picking items, equipping weapons, using stimpacks, etc. Great to get a quick glance of the possibilities offered by the combination of these two assets.